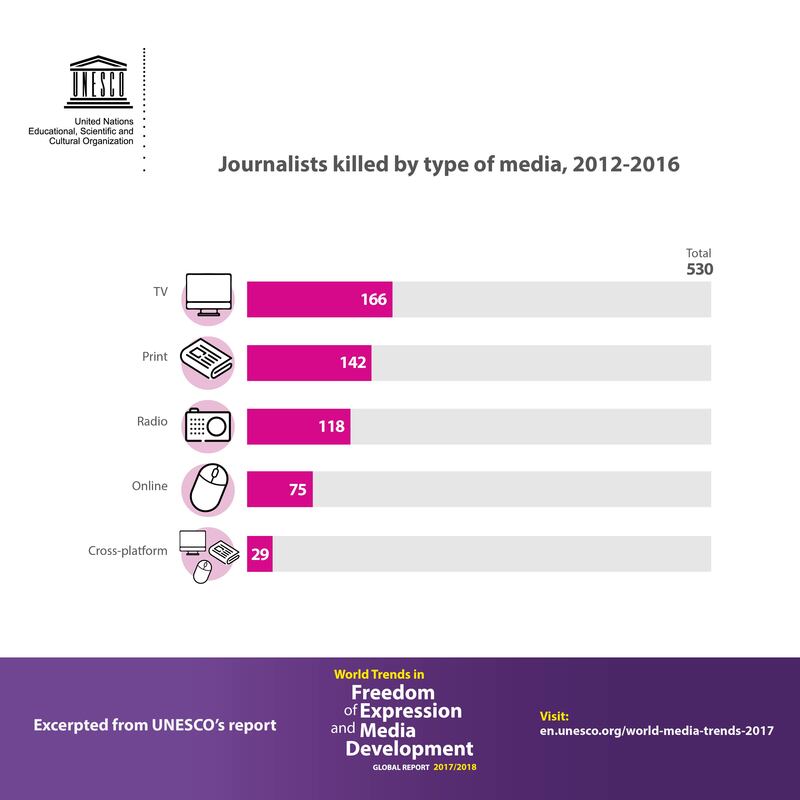 Growing attacks on journalists – A trend that may have been even worse if it were not for the UN Plan of Action on the Safety of Journalists and the Issue of Impunity. 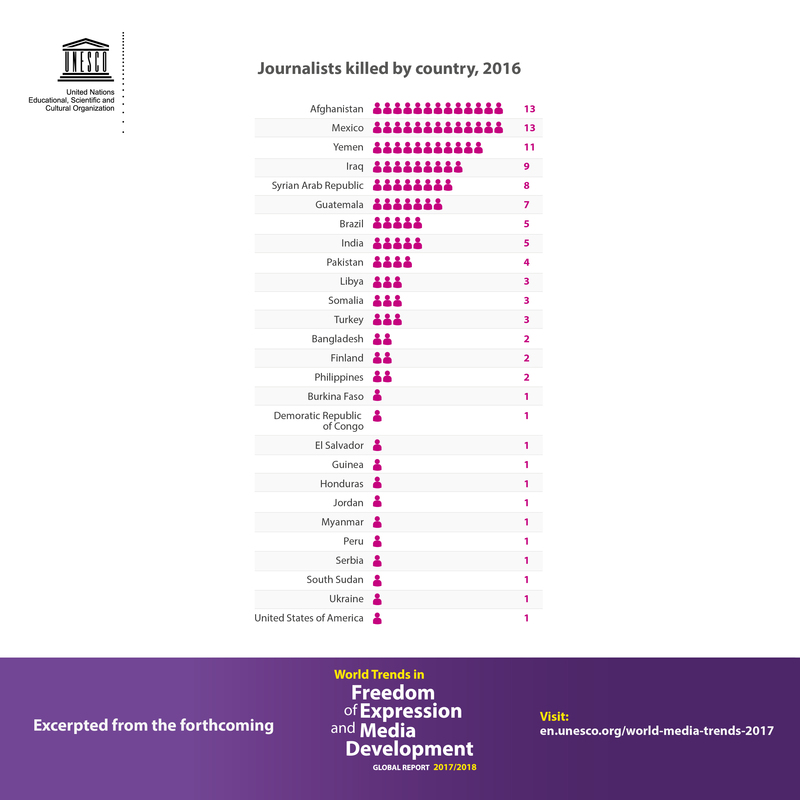 Between 2012 and 2016, 530 journalists were killed, an average of two deaths per week. 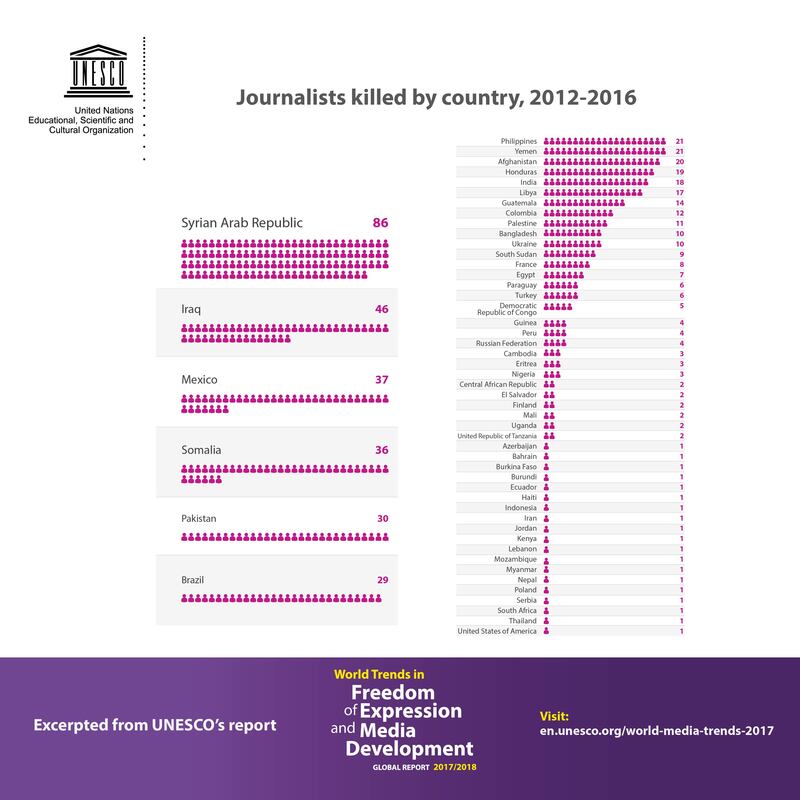 Due to continued conflict and instability, killings in parts of the Arab region remain very high. 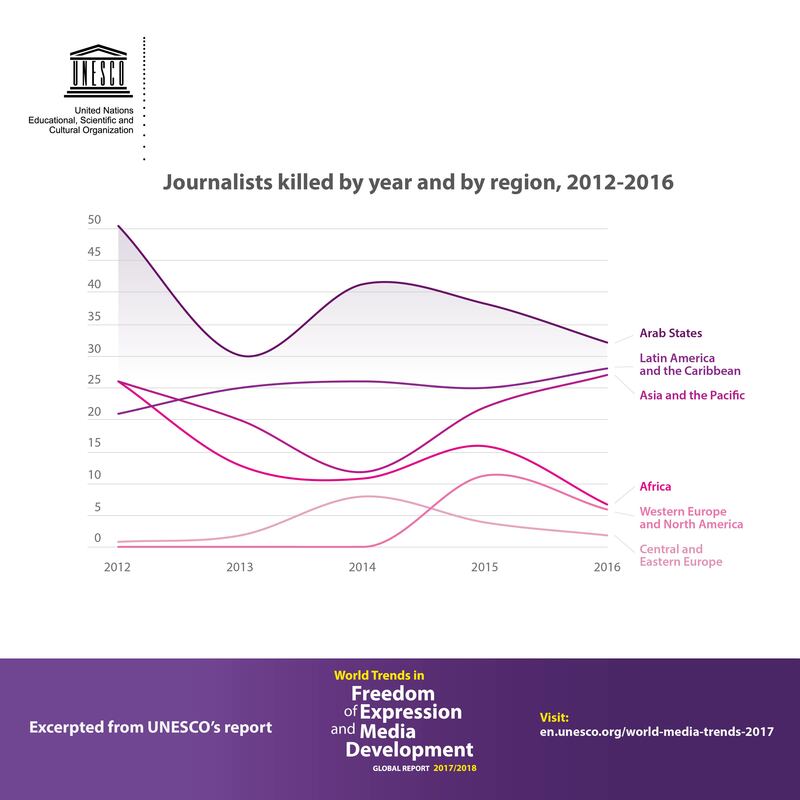 After a peak in 2012, the African region witnessed a significant decline in killings of journalists. 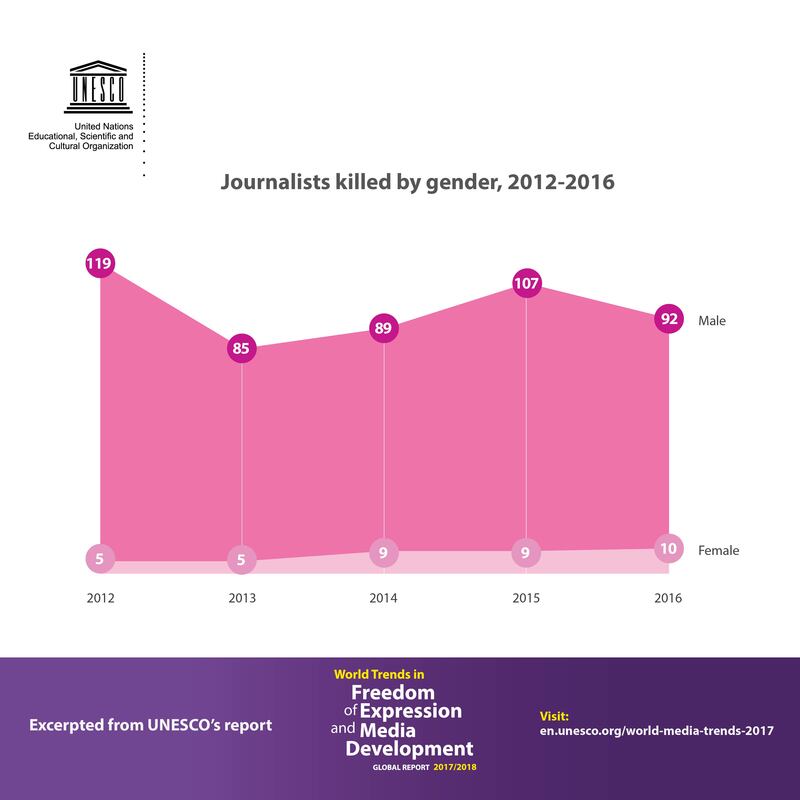 Killings of women journalists increased during the period, from five women journalists killed in 2012 to 10 in 2016. 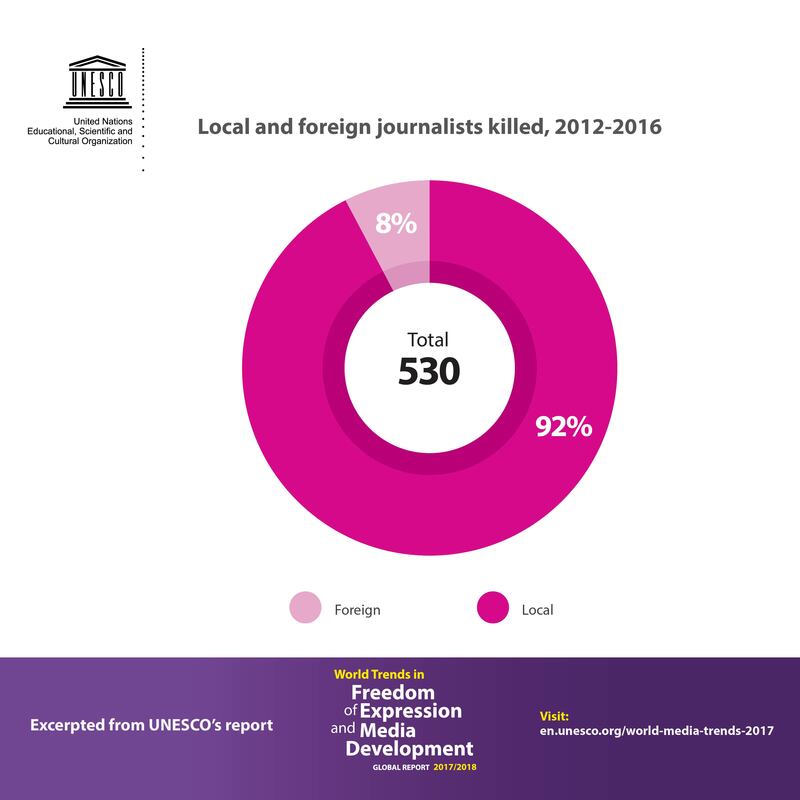 Although the killings of foreign correspondents tend to garner global publicity, 92 per cent of journalists killed during this period were local reporters. 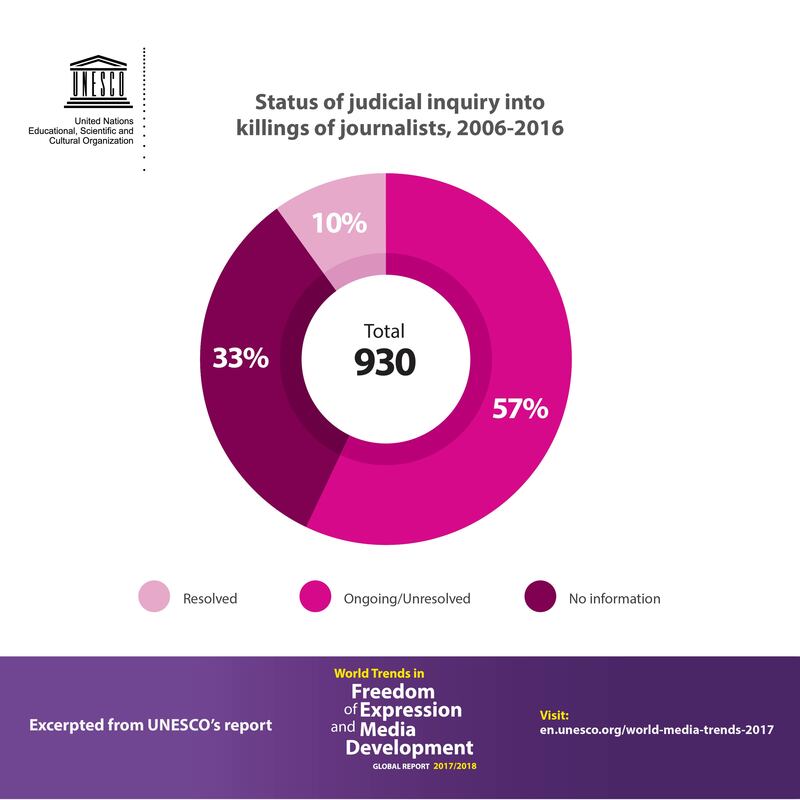 Impunity for crimes against journalists remains the norm, with justice in only one in 10 cases. 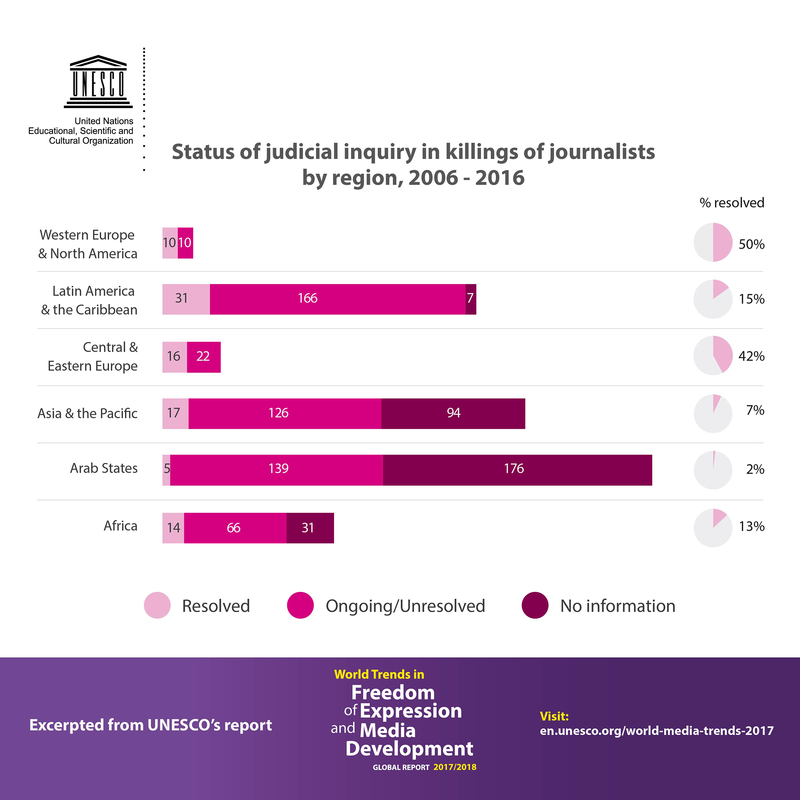 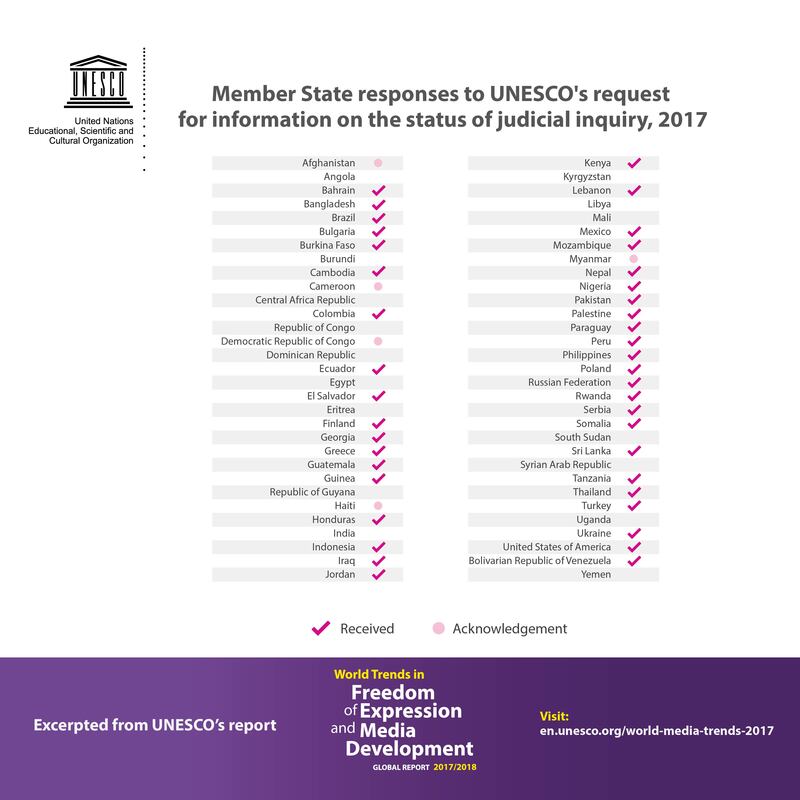 However, Member States have shown increased responsiveness to the Director-General’s request for information on the status of judicial inquiries into killings of journalists, with more than 70 per cent responding—in varying degrees of detail—in 2017. 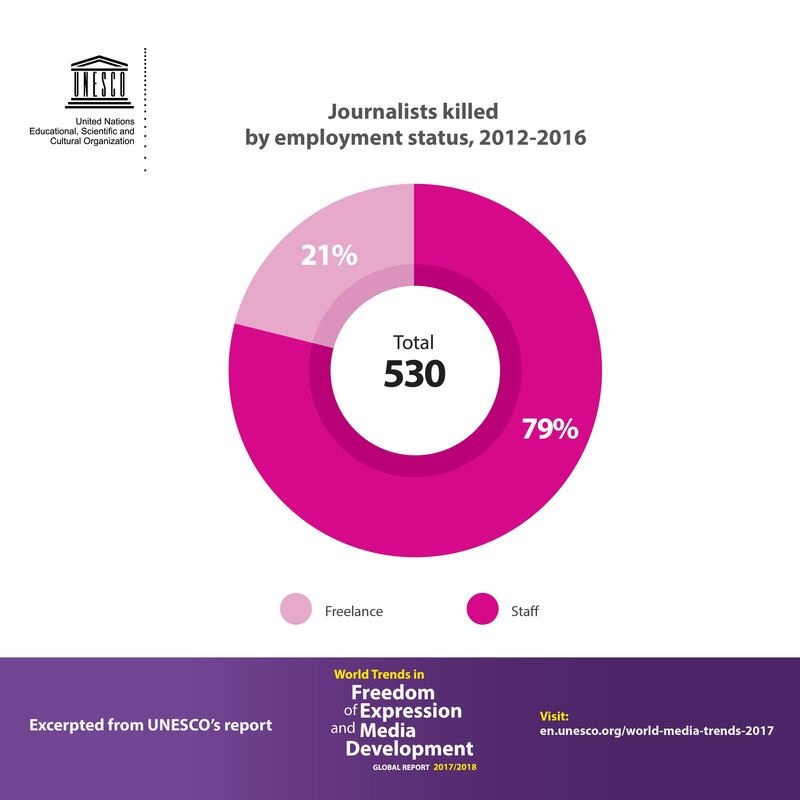 In 2013, the UN General Assembly declared 2 November as the International Day to End Impunity for Crimes against Journalists, which is increasingly observed across the world. 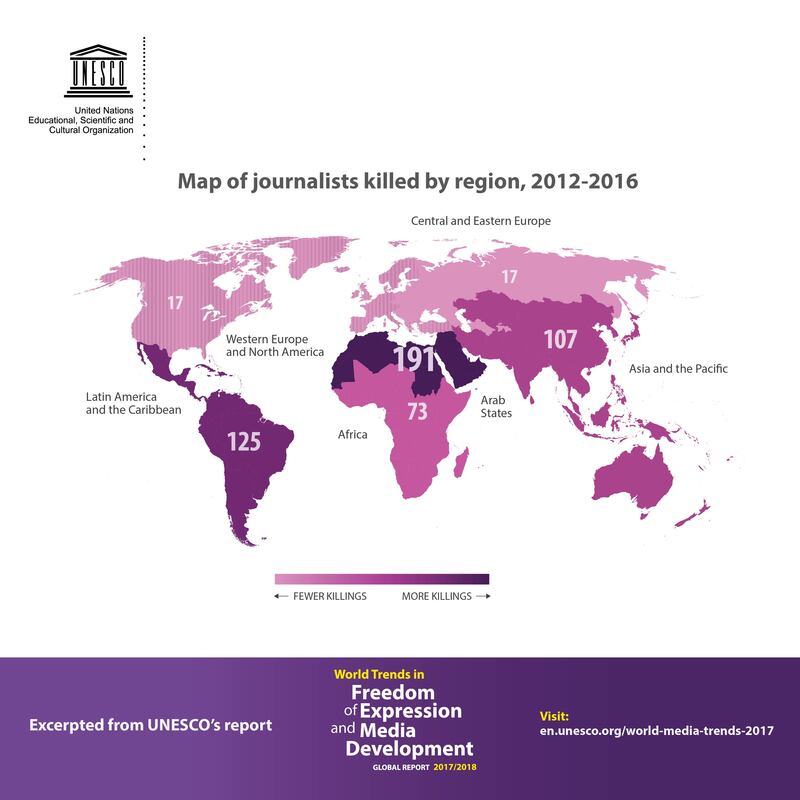 Continuing on earlier trends, there has also been a substantial rise in other forms of violence against journalists, including in kidnapping, enforced disappearance, arbitrary detention and torture. 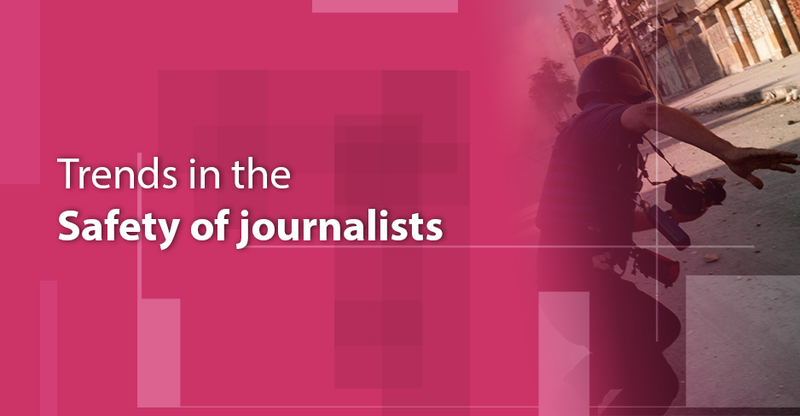 The Arab region has seen a sharp rise in journalists taken hostage by violent extremist groups. 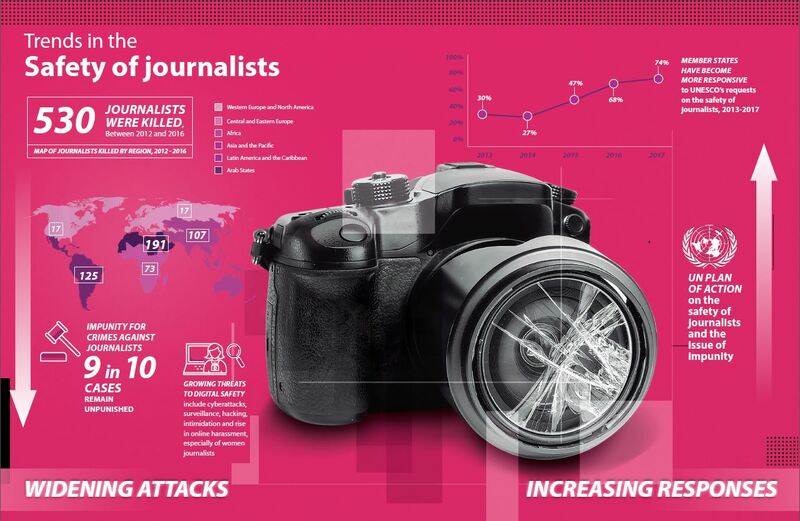 Digital safety is an increasing concern for journalists across all regions, with threats posed by intimidation and harassment, disinformation and smear campaigns, website defacement and technical attacks, as well as arbitrary surveillance. 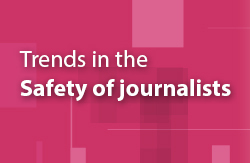 Women journalists, in particular, have experienced increasing online abuse, stalking and harassment. 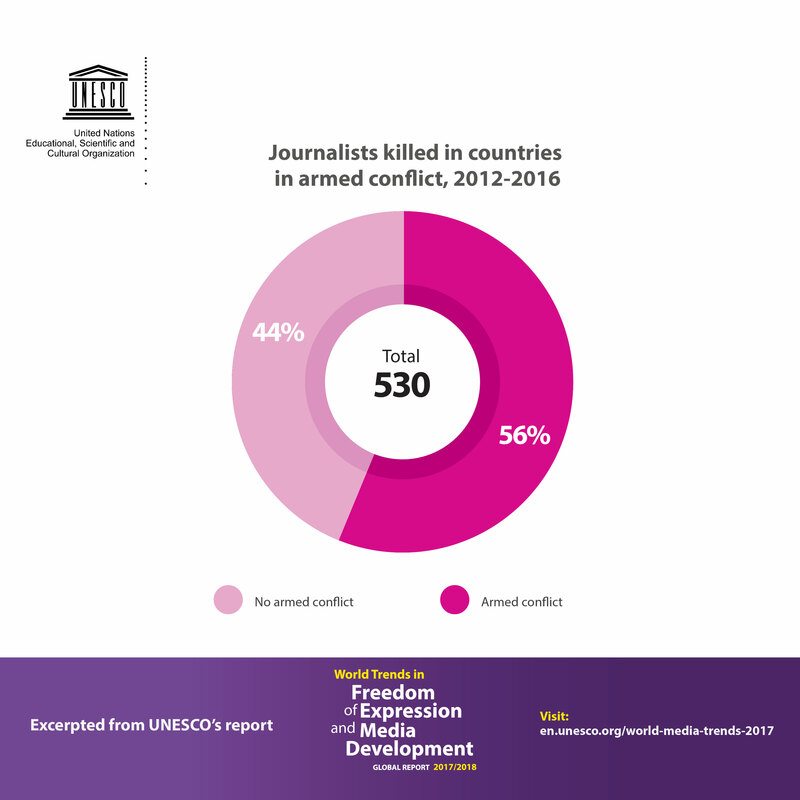 Despite the difficult circumstances under which many journalists work, significant steps have been taken to raise awareness of, and counter violence against, journalists through the UN Plan of Action on the Safety of Journalists and the Issue of Impunity. 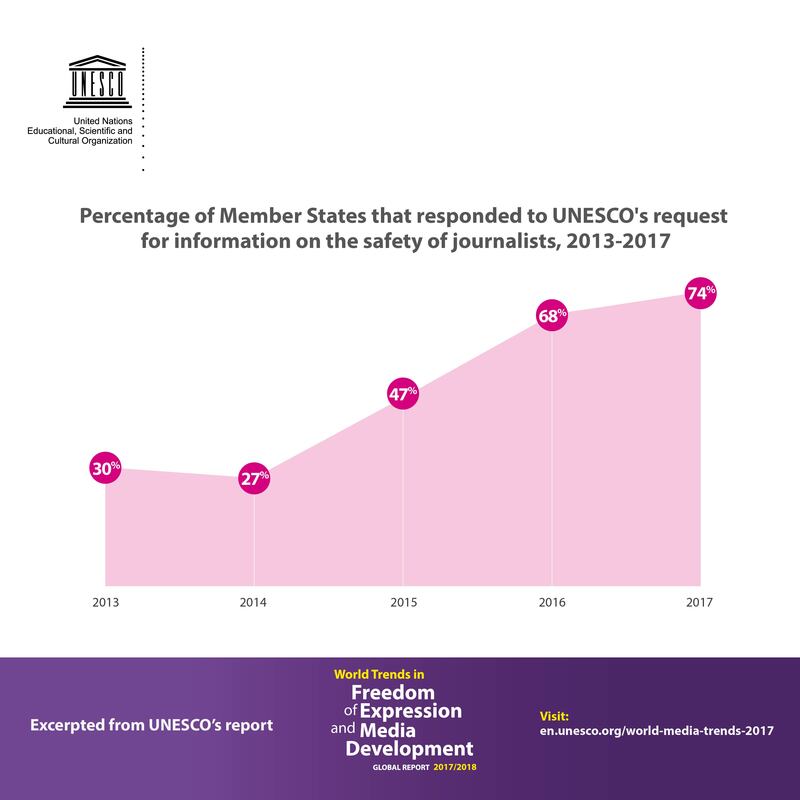 Since 2012, the UN General Assembly, UN Human Rights Council, UN Security Council and UNESCO have adopted 12 resolutions or decisions related to the safety of journalists. 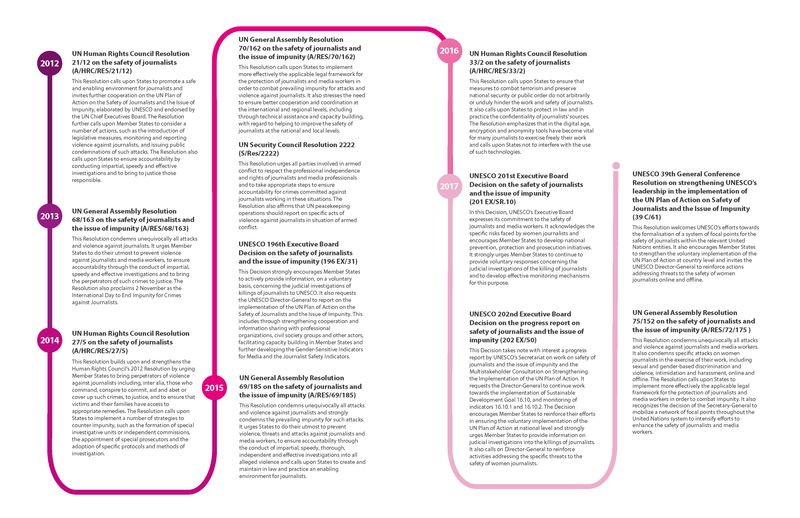 A multi-stakeholder consultation to review implementation of the UN Plan of Action took place in June 2017 in Geneva, Switzerland, leading to 30 forwardlooking options for action to be considered by the UN, Member States, regional intergovernmental organizations, civil society, media actors, internet intermediaries and academia.